Before I began raising angora rabbits, I thought all angora was white, short, and full of matted bits. I had purchased angora several times over the years, and it was always like that--and always a pain to spin, too. When I bought our first bunnies, I began to learn about the four main breeds of angora rabbits--yes, there's more than one kind! And about the dozens of natural colors they come in--yes, there's more than just white! At first this information was rather overwhelming, but I gradually began to learn the terminology and become familiar with the breed characteristics of each type of angora rabbit. The next surprise was that angora doesn't have to be short or full of matted bits. The way the angora is grown, harvested, and stored, has a lot to do with the quality available for sale to handspinners. This article will be a brief overview of the types of angora, their natural colors, and the qualities of fiber available for sale, along with some tips for choosing the best angora for your own special projects. The four main breeds of angora rabbit are the English, French, German or Giant (technically two different breeds, but indistinguishable in the fiber), and Satin. Each has distinctly different breeding backgrounds and characteristics. I'll just talk about the differences in their fiber. In this picture you can see a lock of white English angora, a lock of red Satin angora, a headband made of black French angora, and a sweater made of dyed wools blended with white angora, probably English or a cross. English angoras produce wool that is known for its extraordinary softness. Yes, all angora is soft, but English is noticeably softer than the other breeds. This is because English angoras lack the heavy amount of guard hair of the other angora breeds. In angora, guard hair isn't scratchy like you might think. But it isn't quite as soft as the undercoat of the bunny. Since English angoras have no or very little guard hair, their wool is the softest of all. 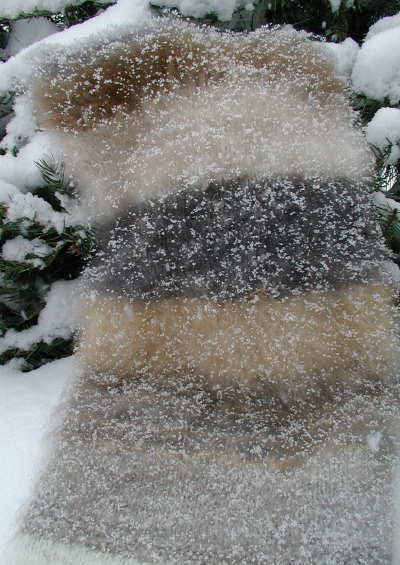 The halo or fluffiness of the angora yarn is short and very cloud-like in English angora, again due to the lack of guard hair. 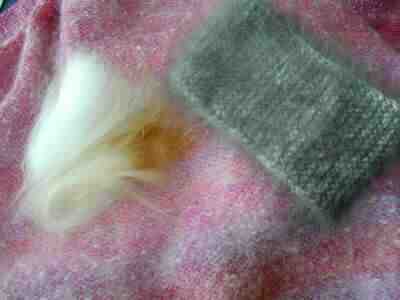 The color is softer, too, as most of the color of angora is concentrated in the guard hair. English is best chosen for a project that needs softness more than drama. French angora is my personal favorite, because the bunnies have lots of guard hair, making them easier to maintain without matting. And since the guard hair is stiffer and more intensely colored, French angora is more dramatic than the other angora fibers. The halo is spikey in appearance, even though it's still far softer than any wool, for example. And French angora may be a little easier to wash than other types of angoras as the guard hair will make it less likely to felt. Satin angora is truly the royalty of the angoras. As its name suggests, each fiber in the angora has a sheen like silk. When spun alone, the halo is a cross between that of French and English--some spike, but not a lot. The yarn will look like it's a mixture of shiny silk and soft angora--very striking. The color is often as intense as with the French, because of the shiny fibers. Satin is truly a luxury fiber, as the bunnies don't produce as much wool as the other breeds and they tend to matt more easily. Breeders are working to improve yield. For now, though, Satin is usually the most expensive and difficult to find type of angora. German and Giant angoras, the largest of the angora rabbits, were originally bred in Germany to produce large amounts of fiber regularly, to send to mills for spinning into angora yarns. Unlike the other breeds, German/Giant angora must be shorn or clipped from the rabbit. Officially, there are only white Germans, so the fiber can be commercially dyed. In the US, some Germans have been developed into a breed called Giants (while other breeders have maintained the pure German type). Some breeders are crossing Giants with angoras of other breeds, then breeding back to the original standards, to introduce color. The softness of the German/Giant I have seen has been between that of English and French, while the halo is similar to the English. Methods of harvesting angora rabbits include shearing/clipping, mentioned above, and plucking. Any bunny may be sheared using electric shears, or clipped using scissors. English, French, and Satin angora rabbits may often also be plucked. Plucking is the process of pulling out the fiber of the rabbit when it is being shed. This isn't much different from combing out a dog or cat when it is shedding, and doesn't hurt the bunny at all, if done at the right time. Shearing or clipping has the advantage of being a fast method for harvesting fiber from an angora rabbit. It's therefore somewhat less stressful for the bunny, once trained to the clippers, and certainly easier for the breeder. However, many handspinners find better fiber quality comes from plucking. This is because bunnies who normally shed their wool, and therefore can be plucked, have several coats growing at any one time. Each coat is a different length--the outermost fibers may be four or more inches long, while the shortest, newest coat may be under 1/2 inch / 1.3 cm in length. Obviously, if a bunny with different lengths of fiber is shorn, the harvested coat will have a variety of lengths in it. When spun, whether by hand or machine, the shorter bits of fiber are very likely to shed out, causing the problem many wearers of angora products are familiar with. This shedding is almost eliminated when the fiber was plucked when ready. Plucked angora has fibers all about the same length. When spun, by hand or machine, these fibers are all caught into the twist the same amount. Only a very loosely spun yarn of plucked angora will shed. Another advantage of plucked over sheared or clipped fiber is that the breeder must wait until the coat is ready to shed before plucking. This means the fiber will typically be at least three inches long, and in those rabbitries where the breeder has selected for long fiber, the plucked angora may well average four inches and longer. A breeder who typically shears or clips her bunnies can do so whenever she wants to. In my experience, clipped or shorn fiber averages under three inches in length and sometimes has lots of fiber shorter than that. For this reason, plucked angora is generally easier to spin than shorn or clipped angora, though of course there may be some breeders who clip only when the wool has reached at least three inches in length. Other than the type of angora and harvesting method, the way the angora is stored has much to do with its quality. The very best quality angora is sorted as it is harvested, into rigid containers between layers of tissue paper. This prevents the angora from becoming crushed and compressed. Angora can matt or felt quite readily. If it's stored in a way that allows it to be compressed it can matt so that it's hard to open up for spinning. Quality of angora varies widely from breeder to breeder. When you decide to order angora, ask some questions about quality. For example, ask what breed it is, how long the fiber, how it was harvested, whether any of it is matted, and how it was stored. The term "Prime" is sometimes used to describe angora quality. Technically that only means the average fiber is three inches in length. I have ordered angora by mail labeled prime, only to find it averaged less than three inches, was shoved by messy handfuls into a bag or box, and sometimes was dirty to boot. So ask your specific questions, or keep your order small until you have a chance to see what the breeder actually produces. Other qualities of angora may be acceptable to you for a particular project. Many breeders have 'seconds', angora that may be a bit matted or dirty or short, which can spin into delightful textured yarns. If you want texture from your angora, don't pay extra for prime, ask around for this second quality instead. The incredible range of natural angora colors is a delight in spinning. There's lots of white, of course, in each of the breeds, which can, like colored angora, be overdyed with natural or synthetic dyes. Other colors include dark grays (black is the official name), light grays (blue), rusty oranges (red), light golds (fawn), warm caramel browns (torts), cool taupe gray/browns (chocolate) and a host of other colors. It's also helpful to be aware that the color usually changes along the length of each individual fiber. "Self-colored" bunnies are darker toward the tips, shading to a pale value of the same hue near the skin. Other bunnies actually produce striped colors! My personal favorite is the color copper. The length of the fiber is striped in black and rusty brown, and the color really does suggest copper when spun, especially if the fiber was from a Satin Angora rabbit. Until you become familiar with the different colors of angora, do ask the breeder you order from to describe the colors fully so you know what to expect. I hope this article has opened your eyes to the variety of types, colors, and qualities of angora available to handspinners today. Naturally, this information is based on my personal experience with breeding angora rabbits and harvesting and spinning their fiber. If you have any additional information, please feel free to contact me and I will review that information and incorporate it into my article, along with your name.